Address: Suiza, 2, Puerto del Carmen (Lanzarote), Islas Canarias. This elegant hotel opposite Los Pocillos beach has its own outdoor swimming pool and tennis courts, and elegant rooms with furnished terraces. Enjoy a relaxing beach holiday with friends and family at the Lanzarote Village, excellently located in the popular Puerto del Carmen resort. Admire the views of the sea or swimming pool from your well-equipped room. Sunbathe by the hotel’s pool, or relax in the hot tub or with a massage. 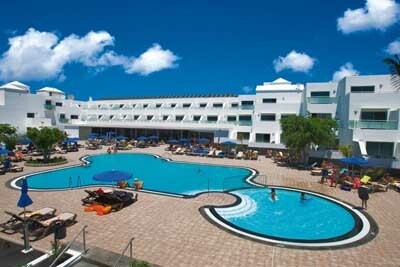 Guests can take advantage of the Lanzarote Village’s billiards, table tennis and darts facilities. You can also rent a bicycle at reception and cycle along the sunny coast. There is a games room and playground for kids, who will enjoy the entertainment activities on offer. At meal times, head to the non-smoking buffet restaurant, and grab a drink at the cocktail bar, where you can enjoy daily live music. Guests are required to show a photo identification and credit card upon check-in. Please note that all Special Requests are subject to availability and additional charges may apply. Please note that children over 12 years as considered as adults.